We’ve started issue 65 and the current planned release date will be towards the end of April. Do please get in touch if you’d like to contribute at all! Also we have another sticker design in stock now… once the current run of stickers has all gone, then these ones will be stuffed in with all orders. We’ve also added a few records onto the shop (there may be more to come soon…) so do grab some stuff from us and help us whittle down an old distro stock so we can make some space for more zines – cheers! We’re back! With the first issue of 2019! Featuring interviews with: Misgivings, Shout Louder, Sad Sally & Helen Messenger Photography. There’s a load of columns as well. 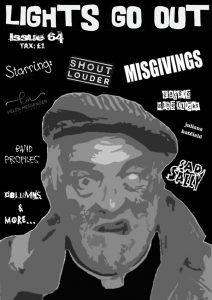 Gadgie @ The Flicks tackles ‘Some Kind Of Wonderful’. Anna Sanderson revisits ‘Ticket To Ride’ by the Carpenters. Jeff Gemmill’s first listen of ‘Weird’ by Juliana Hatfield. An extract from ‘ The Only War’ by Jason Wray-Stevensson. And columns from Paul Initonit, Emily Ewing & Mr. T. Band Profiles: Luna Rosa, Override, She Burns Red & Hot Rockets. And of course a shitload of music reviews too! 32 pages, rammed with stuff to read. So if you fancy picking a copy up from us please grab one from the store HERE – thanks. Oh and we have also added some more music to the store with releases from Eastfield, F. Emasculata and the amazing split from Jobseekers & The Hoors. So do pop some listening into your order if you feel like it. As always, cheers to everyone who contributed to the new issue and thanks to those of you who support us and purchase a copy. Issue 63 – released next week! Let’s do the announcement thing… so we’re pleased to announce that issue 63 of Lights Go Out will be released on Monday 3rd Dec. 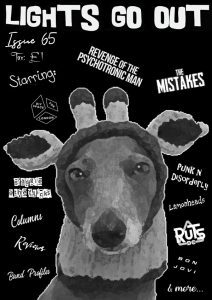 Featuring chats with: Therapy, These Animal Men – Brighton, UK, The Drunken Ramblings, Verity White Band, also Gene and My Life Story feature. Marv is back with another installment of Gadgie Fanzine @ The Flicks where he tackles Psycho II. Also a chat with Tony D of Ripped And Torn Zine! There’s music and live reviews in there too. As always it’s a quid plus postage, 32 pages in this issue. If you fancy something to read (we’re not sure they make great Christmas presents, but hey that’s up to you…) then please do grab a copy from the site. Nice one, cheers! 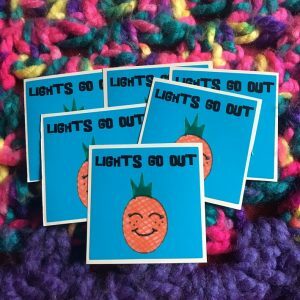 We are dead chuffed to be able to announce issue 62 of Lights Go Out Zine… this time we’re putting out a split zine with the incredible Gadgie! We did a Star Wars split a few years back and we’ve decided to share another print run, 16 pages each! 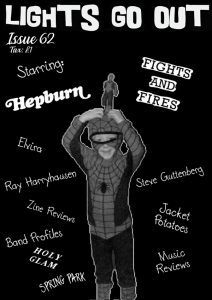 Issue 62 features a two part interview with members of the pop rock band Hepburn who had a couple of hits at the turn of the millennium. Also a chat with Lee from Fights & Fires, but no ordinary chat… we talk about jacket potatoes!! There’s columns on Steve Guttenberg, Elvira and Ray Harryhausen. There’s some music reviews and some zine reviews too. Band profiles from Holy Glam & Spring Park. 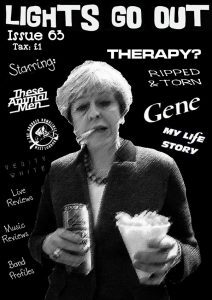 So we did a few little different, fun things with this split issue, so do please grab a copy from us or Marv of Gadgie Zine. It’ll be released early November and pre-orders can be placed now!!! Thanks for supporting the zine once again.